Computerworld - The punchline to an old cartoon is "On the Internet, nobody knows you're a dog," but these days, that's no longer true. It's easier than ever for the government, Web sites and private businesses to track exactly what you do online, know where you've visited, and build up comprehensive profiles about your likes, dislikes and private habits.And with the federal government increasingly demanding online records from sites such as Google and others, your online privacy is even more endangered. Privacy Analysis of Your Internet Connection gathers and displays basic information, such as your operating system, screen resolution, what site you previously visited, general system setup and so on. BrowserSpy delves even deeper into your system and even reports on whether you have certain software on your system, such as RealPlayer and Adobe Acrobat, including version information. The best way to make sure Web sites can't gather personal information about you and your computer is to surf anonymously by using an anonymous proxy server that sits between you and the Web sites you visit. When you use an anonymous proxy server, your browser doesn't contact a Web site directly. Instead, it tells a proxy server which Web sites you want to visit. The proxy server then contacts the Web site, and when you get the Web site's page, you don't get it directly from the site. Instead, it's delivered to you by the proxy server. In that way, your browser never directly contacts the Web server whose site you want to view. The Web site sees the IP address of the proxy server, not your PC's IP address. It can't read your cookies, see your history list or examine your clipboard and cache because your PC is never in direct contact with it. You're able to surf without a trace. There are three primary ways to use anonymous proxy servers. You can configure your browser to use a such a server (or get software to do it for you); you can visit an "anonymizer" Web site, which does the work of contacting the server; or you can download software that will ensure your anonymity when you use the Internet. We'll look at how to do each. The best free software you can find for being anonymous when you use the Web is to use the free Tor. When you use Tor, all your communications -- not just Web surfing, but also instant messaging and other applications -- are in essence bounced around a giant network of Tor servers called "onion routers" until it's impossible for sites or people to be able to track your activities. Setting up Tor is straightforward. Download a package that includes not just Tor, but other software you need to work with it, such as Privoxy, a proxy program. All the software is self-configuring, so you won't need to muck around with port settings or the like. Tor runs as a small icon in your system tray. To start Tor, right-click it and choose Start from the menu that appears; to stop it, right-click it and choose Stop. Once it starts, simply use the Internet as you normally would. If you're superparanoid, you can regularly change your Tor "identity" to make it even harder for anyone to track your travels. Right-click the Tor icon, and select "New Identity." That's all it takes. A number of free Web sites offer free anonymous surfing via proxy servers. 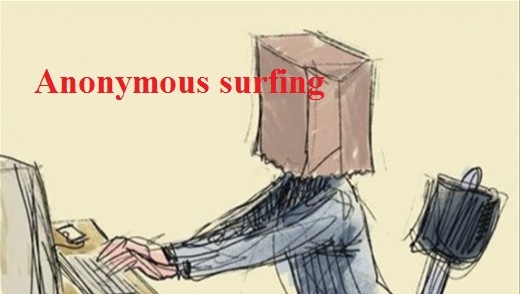 The benefits of these sites are obvious: When you surf, you're anonymous. But there are some drawbacks as well. Surfing tends to be slower -- and in some cases very slow. And when you use these Web sites, some sites you visit from them don't display properly. The sites all work pretty much the same. Head to them, and in a box, type the Web site you want to visit. From that point on, you'll be surfing anonymously; the site does the work of using an anonymous proxy server for you. If you don't like the limitations imposed on you by sites like the Cloak or would simply prefer to configure anonymous surfing yourself, you can easily set up your browser to use an anonymous proxy server to sit between you and the sites you visit. To use an anonymous proxy server with your browser, first find an anonymous proxy server. Hundreds of free, public proxy servers are available, but many frequently go offline or are very slow. Many sites compile lists of these proxy servers, including Public Proxy Servers and the Atom InterSoft proxy server list. To find others, do a Google search. I prefer Atom InterSoft proxy server list because it provides more information about each server. It lists server uptime percentage and the last time the server was checked to see if it was online. In Internet Explorer, select Tools-->Internet Options, click the Connections tab, and click the LAN Settings button. Check the "Use a proxy server for your LAN" box. In the Address field, type in the IP address of the proxy server. In the Port field, type in its port number. Check the "Bypass proxy server for local addresses" box; you don't need to remain anonymous on your local network. Click OK and then OK again to close the dialog boxes. Now when you surf the Web, the proxy server will protect your privacy. Keep in mind that proxy servers can make surfing the Web slower, depending on the proxy you're using. VPNs are used for secure Anonymous Surfing; hiding real IP address, Bypass geographical blocks, Bypass ISP Blocking for VOIP Applications like Skype. So, what is VPN [Virtual Private Network]. Basically it’s a private network which lets users to connect to other users or remote sites using a public network usually internet. It uses “virtual” connections routed through the Internet from the company’s private network to the remote site or employee instead of physical connections. In short, it is private network constructed within a public network infrastructure, such as the global Internet. The another solution is to use Proxy Chaining for all the anonymous browsing needs. It can be used to avoid all sorts of limitations imposed by various sites. Be that a download site that limits amount of downloads. Or video site works only in a particular country - more often than not it gets defeated by the anonymous browsing features Proxy Switcher provides. IP Hiding tools hide your IP address while surfing online, providing online privacy and anonymous web surfing. These tools (both free and paid versions) support anonymous proxies. The Firefox extension called "switchproxy," for example, supports defining a pool of proxy servers in the Web browser and automatically switching between them at regular time intervals. In general, these tools help you both find proxies and also simplify the process of configuring and using them. The ability to hide an IP address increases your privacy on the Internet. Other approaches to improving Internet privacy also exist and complement each other. Managing Web browser cookies, using encryption when sending personal information, running a firewall and other techniques all contribute toward a greater feeling of safety and security when going online. * Note : If torrent doesn't work please leave comment i will replace torrent link with mediafire links.